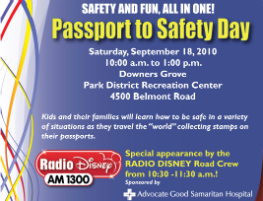 Kids and their faimilies will learn how to be safe in a variety of situations as they travel the “world” collecting stamps on their passports at Passport to Safety Day. The event will be on Saturday, September 18, 2010 from 10:00 a.m. to 1:00 p.m. at the Downers Grove Park District Recreation Center, 4500 Belmont Rd. Special Appearance by the Radio Disney Road Crew from 10:30 -11:30 a.m.! Visit with Officer Patti and Freddie 2.5, the youngest safety experts from the Downers Grove Police and Fire Departments. House of Hazards, presented by Liberty Mutual and more!